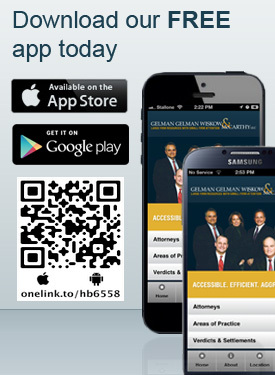 Gelman Gelman Wiskow & McCarthy LLC was established in 1950 by a Harvard lawyer who returned to his hometown to provide his neighbors with the very best legal services. Our experienced New Jersey injury attorneys and dedicated staff continue the tradition of offering our clients the highest level of personal attention and results-oriented legal representation. Why retain our law firm? Experienced — Gelman Gelman Wiskow & McCarthy LLC currently comprises a team of attorneys who possess almost a century and a half of combined experience. Team-oriented — Our team approach means that each attorney is supported by her or his own paralegal and secretary, so at least three people work on every case. Bilingual — We are able to serve our Spanish-speaking clients with the assistance of our bilingual Hispanic staff. Accessible — Our law firm has offices in Elmwood Park, Dover, Mendham and Newton, NJ. Efficient — We act decisively to resolve your case as soon as possible, so you do not have to wait to recover your compensation. Catastrophic injuries — Our law firm has the substantial resources and knowledge to successfully litigate the most challenging catastrophic injury cases. Auto accidents — We demand that insurance companies pay maximum auto accident damages expeditiously and justly. Medical malpractice — Our medical malpractice attorneys hold medical professionals accountable for their mistakes. Personal injury — In 2018, we settled or won, at arbitration/mediation/trial, just over 100 personal injury cases. In total, we recovered almost 9 million dollars for our clients. In the last 5 years, we have settled/won over 600 personal injury cases and recovered over 40 million dollars for our clients. Last year, our clients’ average recovery was (a firm record) $95,000.00. Workers compensation — In the last 5 years, our firm has resolved over 500 workers compensation cases for in excess of 5 million dollars. Social Security Disability — Results may vary depending on your particular facts and legal circumstances. In the last four (5) years, our firm has successfully “won” over 80% of our social security disability appeals. *Results may vary depending on your particular facts and legal circumstances. We’ve been helping victims obtain the compensation they need for more than 60 years. For additional information about pursuing compensation for your injuries, call Gelman Gelman Wiskow & McCarthy LLC at 973-366-3900 or contact us online to schedule your one-hour free initial consultation. We have offices in Elmwood Park, Dover, Mendham and Newton for your convenience. In 2018, we settled or won, at arbitration/mediation/trial, just over 100 personal injury cases. In total, our clients recovered just under 9 million dollars. In the last 5 years, we have settled/won over 600 personal injury cases and our clients have recovered almost 50 million dollars. In the last 5 years, our firm has resolved over 300 workers compensation cases for in excess of 3 million dollars. During that same time period, our social security clients have prevailed in almost 85% of their appeals. Results may vary depeding on your particular facts and legal circumstances. Gelman Gelman Wiskow & McCarthy LLC is located in Elmwood Park, NJ and serves clients in and around Wayne, Pequannock, Haledon, Lincoln Park, Hawthorne, Paterson, Pompton Lakes, Franklin Lakes, Little Falls, Riverdale, Oakland, Wyckoff, Totowa, Towaco, Fairfield, Midland Park, Glen Rock, Cedar Grove, Haskell, Fair Lawn, Caldwell, Montville, Bergen County, Morris County and Passaic County.